Vaseline-like texture remains on the surface of the hoof and in between each half of the hoof long enough to work. A very powerful agent in the battle against footrot and foot scald. Can only be sold to US addresses. Cannot ship air freight. For treatment of individual cases of footrot and foot scald. Contains: Wool Grease, Copper Sulphate, Acetic Acid and Aerosil. A new source has enabled us to pass along significant savings to the end user. 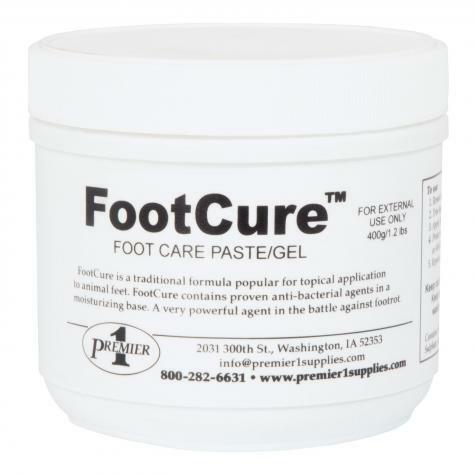 Apply FootCure™ topically. Use latex gloves to keep your hands clean. Applying FootCure™ on a hoof and wrapping with only SureFlexx™ Elastic Bandage Wrap creates a low cost, disposable solution—as the wrap falls off as/when it wishes. We only just started to use this product on a few sheep with foot issues. It seems to stay on the foot well and seems to help; but the consistency that keeps it in place makes it a challenge to use easily. We like it much better than liquid products because it stays put and is more effective. Foot rot is unfamiliar territory for me. Never experienced it in 35 years of handling sheep. Lots of rain and now it's a problem with my small herd. I have used it twice with success both times! I haven't tried anything else but so far so good. Thank you Premier for the guidance. I used this to treat foot scald. It healed two out of three ewes with a single application. Probably would have healed the third with one application had I used with a boot. Coppertox seems to work a little better/faster, but this is still effective and easy to apply, plus a little cheaper. Great product! I used in combination with the foot boot, and in two days it was much better.